BAILEYVILLE, Maine — David Whitney, one of Washington County’s largest wreath manufacturers, recently stopped at a farm in Baileyville to inspect 3,000 fir trees. “Oh,” he said, getting out of his truck to feel the branches, snapping a few off. “These are gorgeous.” As he brushed against the boughs, the smell of Christmas filled the air. From now until Dec. 25, pretty much all of Washington County will smell like the holiday — the county is the wreath capital of the state, and Maine is the largest producer of balsam fir wreaths in the country. 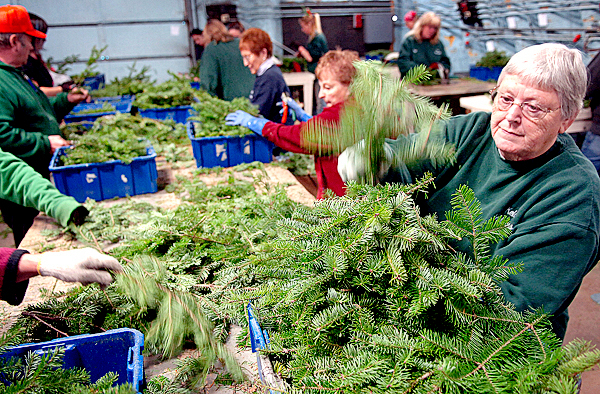 Millions of Maine fir wreaths are shipped across the country each year — sold through L.L. Bean and the QVC home shopping network, to nurseries and florists and out of the backs of pickups on the side of the road. Maine’s wreath makers already are cautiously optimistic about this year’s season. Orders are on par with last year and, for some producers, increasing slightly. That’s good news for the county’s economy, where seasonal businesses rotate to provide a basic living. For the last three months of each year, warehouse spaces from Harrington to Princeton are turned into wreath-making assembly lines, kitchen tables become wreath centers, and home garages are filled with tips. Susan Wallace used to operate her own family wreath business and now manages the Alexander facility for Whitney. 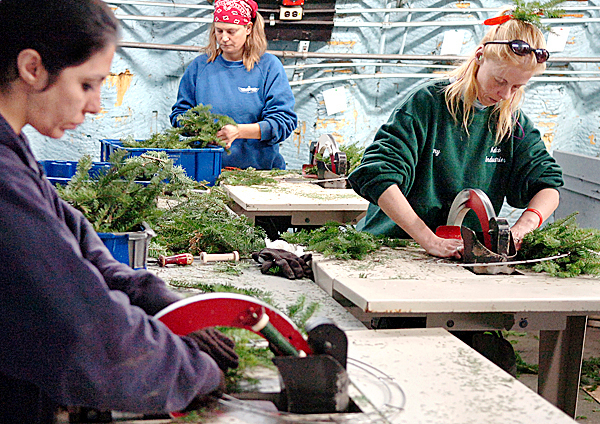 Thousands of Washington County residents work the winter months in the wreath industry. They are tippers, wreath makers, wholesalers and retailers. There also is still a large cottage industry of wreath makers who create wreaths in their homes and sell them — undecorated — to wholesalers. No one in state government tracks the financial impact of the wreath industry. The Maine Department of Conservation monitors tippers, making sure each harvester has the landowner’s permission, but there are no accurate figures for just how great the impact is. The last University of Maine study of wreath marketing was more than 17 years ago, in early 1992. Kelco Industries in Milbridge has 80 workers at the peak of the season; Worcester Wreaths of Harrington has 250 workers; Flo’s Wreaths in Marshfield has 20 employees; while Whitney employs 800 people at the peak of the season, operating out of nine buildings both in and out of Washington County. Doug Kell Jr., a co-owner at Kelco Industries, said it would be very conservative to put the impact of wreath making in Maine at $10 million a year. 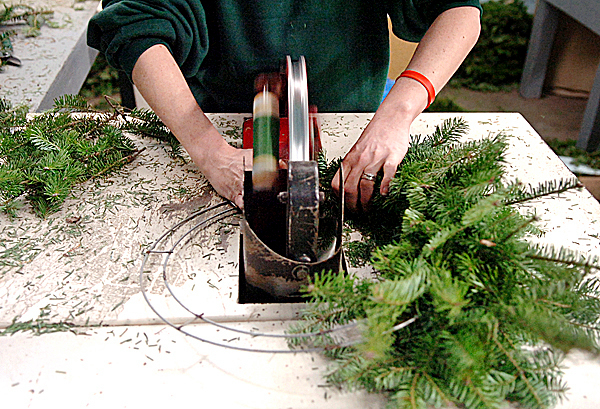 Kelco provides both freshly made wreaths and the metal rings that other wreath producers use. Kell said his customers are being cautious this year and waiting later to buy their rings. 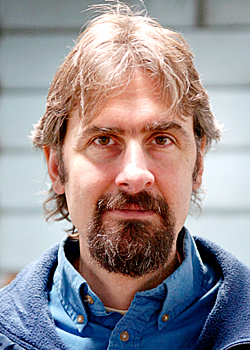 But, he added, he is cautiously optimistic. “Our sales are matching last year’s and we had some out-of-state companies call us, unsolicited, to order this year when they had not last year,” he said. Whitney, who also began making wreaths 20 years ago in his father’s used car dealership — now the home to Whitney Originals and Whitney’s Tool Shed on U.S. Route 1 in Machias — said his season looks good, too. Today, Whitney Originals creates 40 different products, all based on balsam fir tips. Seasonal work is a part of the fabric of Washington County, Whitney said. An employee who makes bows in the fall may be a periwinkle harvester in the summer. Someone who works tying the wreaths may rake blueberries in August. “Everything here has its season,” Whitney said.